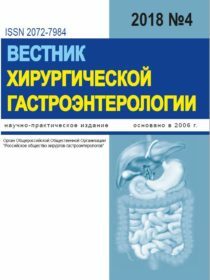 Journal "Herald of surgical gastroenterology" – Academic journal of "Russian society of surgeons-gastroenterologists"
Journal "Herald of surgical gastroenterology"
Academic journal of "Russian society of surgeons-gastroenterologists"
Journal “Herald of surgical gastroenterology” was founded in 2006 year. Materials that are concerned all problems of surgical gastroenterology including urgent and routine surgery are published in the journal. Journal “Herald of surgical gastroenterology” is included to Russian index of scientific citing (RISC) that was founded by Federal agency of science and innovations, RF Ministry of education and science and Scientific electron Library. Founder of the journal: All-Russian common organization “Russian society of surgeons-gastroenterologists” and SBIHC Region clinic hospital Nr 2 (RCH Nr 2). The editorial board consists of leading specialists from different areas of surgical gastroenterology including oncology. The journal is registered in Federal service of low observance inspectorate in sphere of mass communication and maintenance of cultural heritage as central quarterly issue about actual problems of surgical gastroenterology for clinicians, scientific workers and administrators of health care structures. Territory for distribution are Russia, countries of UIS, foreign countries. Journal audience: physicians, scientific workers, teachers and students of medical colleges and universities. Distribution: Editorial subscriptions, catalogue “Rospechat’”- 36806, electron library.